Two hundred years ago, pioneers lived off the land, using what they found in nature to provide their food, shelter, and clothing. Rustic style is a call back to those early days when civilization and nature were interdependent. Inspired by nature, rustic style embraces the simple, the raw, and the rugged. Read on to learn how to achieve that cozy cabin feeling, whether you live on a mountainside, in the suburbs, or even in the middle of the city. Is Rustic Style Right for You? Rustic style uses earthy materials like raw wood and stone to bring elements of the outdoors inside. These components are used in furniture and accessories, as well as in the actual structural design. Rather than using wallpaper and bright paint colors to make a statement, rustic designs use wood and stone to give texture and dimension to interior walls. While some styles favor the look of shiny and new, rustic design embraces age. This homey aesthetic features furniture and appliances with a lovingly weathered appearance, connecting them to a more artisanal time in history. If you crave this coziness in your home, use hammered or tarnished metals instead of bright, shiny ones. Incorporate reclaimed wood from old barns, windows with old-school, wavy glass panes, or new pieces with purposefully distressed finishes. Nothing screams rustic like exposed beams made from raw or salvaged wood. Rough-hewn wood gives off the rugged charm of the frontier, while the beams themselves serve to architecturally frame ceilings, doors, fireplaces, or windows. Rectangular beams provide strong, clean lines while rounded logs infuse a cozy cottage charm. In general, rustic style favors larger, heavier pieces of furniture that look substantial and solid rather than dainty and delicate. Sturdy wooden tables, benches, and chairs are perfect for a dining room, while living room furniture often pairs strong wood frames with comfortable, but simple cushions and fabrics. 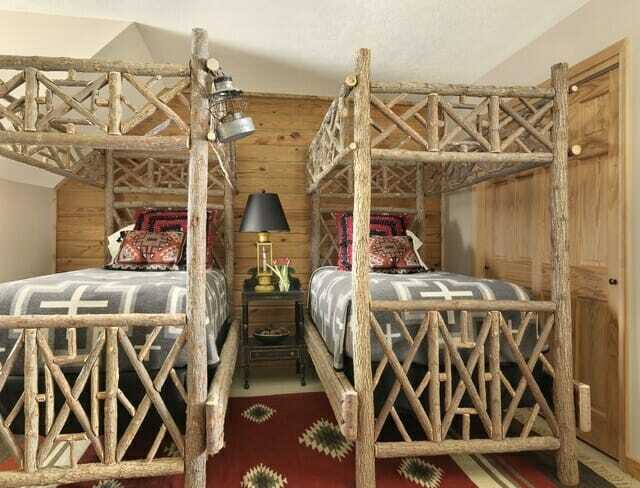 Beds sport wooden headboards or simple iron frames covered with traditional patchwork quilts. Rustic style explores our connection to the past. Old items like milking pails, wooden troughs, water pumps, empty crates, warped glass bottles, and antique books can be re-purposed as sinks, planters, shelves, lamps, and other knickknacks. This designer (below) used an old trunk and two chopping blocks as coffee table and end tables. Using antique items for modern purposes is a just one way that rustic style connects us to our history. 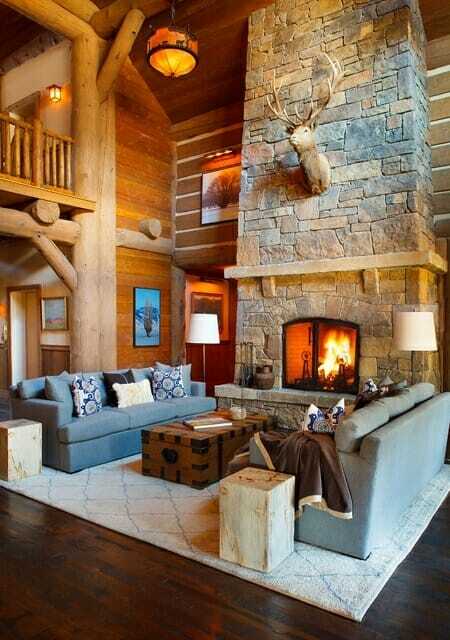 Along with all the raw wood decorative elements, fireplaces are a signature component of rustic style. In the past, the fireplace served a major role by providing warmth and light to the home, as well as heat for cooking. 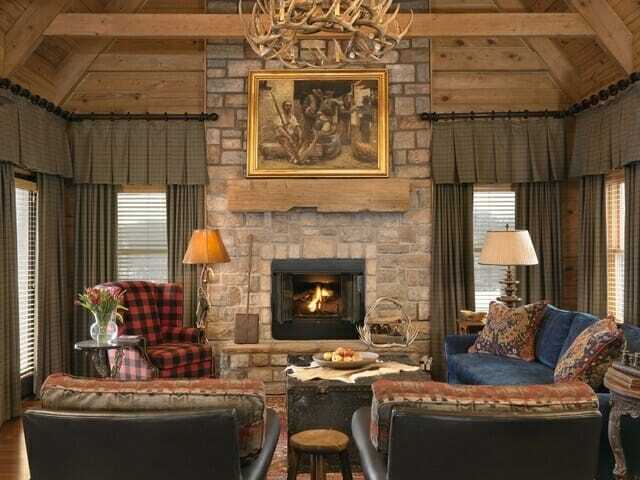 Rustic-style rooms are often centered on a wood-burning stove or fireplace, which creates the perfect balance between the solidity of the stone and the cozy warmth of the fire. Since rustic style is all about embracing the outdoors, it’s only natural to incorporate big picture windows that let in plenty of sunlight and make nature itself a primary feature. This is an especially valuable feature if your house is located in the midst of a beautiful landscape, but even if the view itself doesn’t scream “wild and rugged,” the natural light will brighten up potentially dark rooms and blur the lines between inside and outside. When choosing colors for decorating, stick with warm, natural colors like rich caramels, deep chocolates, and mossy greens. Offset heavy wood and stone with clean whites and creams. While you can incorporate a few brighter colors, think “earthy” tones like terracotta red, golden yellows, or denim blue rather than pastels or jewel-tones. Keep patterns bold but traditional—wide stripes, checks, and plaids suit rustic style far better than busy florals. 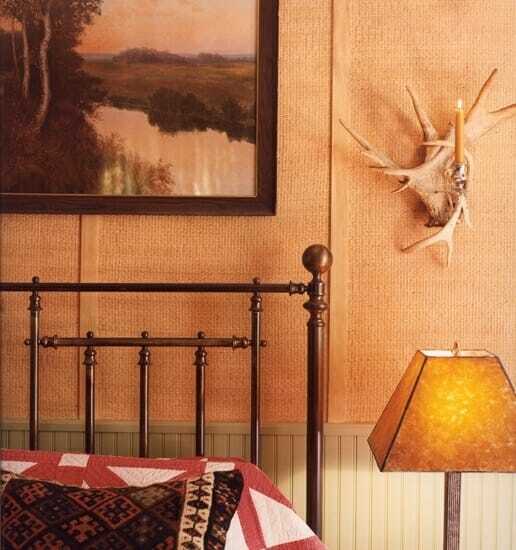 Rustic-style accessories are often inspired by nature. 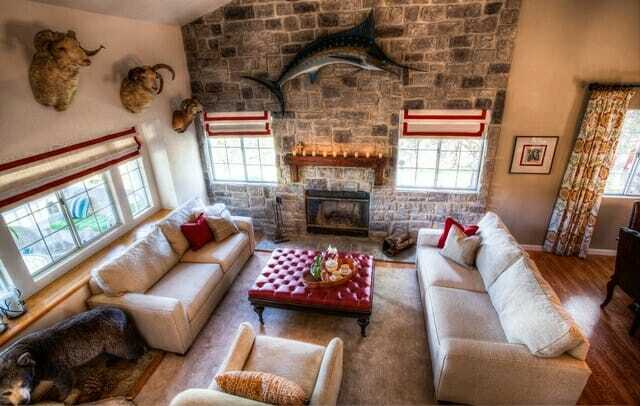 Real or artificial antlers, faux fur rugs, wooden carvings, and taxidermy animals are perfect examples of decorative elements that pay homage to the great outdoors. When it comes to textiles, pioneers were more concerned with function than fashion. They used whatever materials were available to them to make their clothes, blankets, cushions, and rugs. Inspired by these designs, rustic style favors hardy materials like linen, wool, and burlap over softer, flimsier fabrics. Woven rugs and patchwork quilts with classic designs evoke the memory of a simpler time and place. Are you nostalgic for the days of Laura Ingalls Wilder and her Little House on the Prairie? Is your dream vacation a mountain lodge? Are you attracted to people or places that are tough, resilient, and rugged? Do you enjoy building things yourself or have a strong appreciation for handmade things? Do you take inspiration from nature? Do you think of the past as a time when life was simpler? If you answered yes to these questions, then rustic style might just be your perfect match!